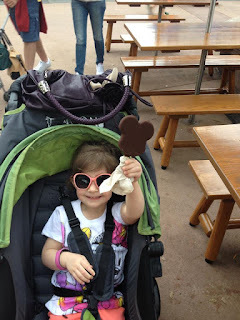 Disney tips, memories, and updates --- from the mom of a second grader. "So come with me, where dreams are born, and time is never planned. Just think of happy things, and your heart will fly on wings, forever, in Never Never Land!" More often than not, booking a flight is the cheapest part of a vacation for me. Every time I go somewhere, I feel the need to update my wardrobe with destination-specific pieces. Disney is no exception to this rule. Sophie really gets the greatest benefit from this habit of mine. I absolutely love finding adorable boutiques and Etsy shops with unique pieces that really stand out, and there are so many that cater to Disney addicts such as myself. This post is all about sharing some of this year's finds and the fabulous shops that sell them. I met Lindsay this summer in Maryland when we both volunteered at HDYO's North American Youth Camp. This girl is FAB-U-LOUS. We connected over the big stuff -- eyelash extensions, excessive packing for a summer camp, and of course -- Disney. Lindsay is a very successful consultant for LuLaRoe (so successful that she was able to retire from her career as a nurse before she turned 30!) 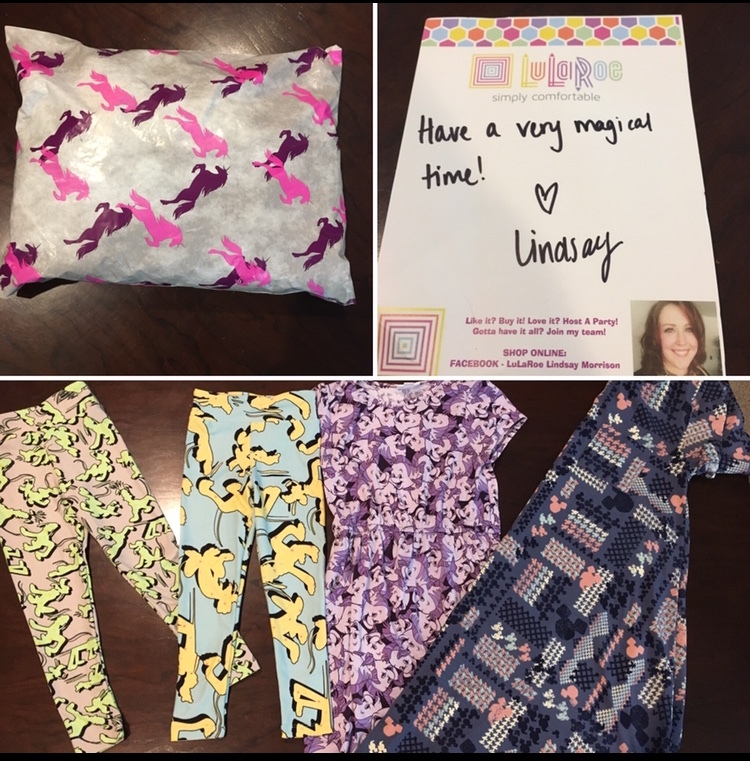 LuLaRoe hasn't exploded in Canada (yet) like it has in the states, so I wasn't familiar with the label. Lindsay sent an amazing care package for Sophie and I, and this stuff is AMAZING. The leggings are so soft they feel like butter. BUTTER! I love their Disney line, and Sophie can't wait to rock her Pluto leggings in the park. 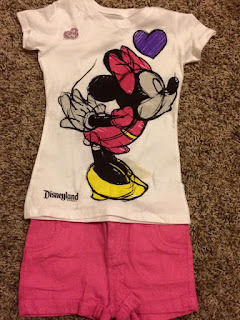 Lindsay also sent an adorable purple Flounder dress for Sophie, and the geo-Mickey dress for me. I've already packed it with my denim jacket... it is SO comfy. If you see me wearing it in every picture for our entire vacation, you'll know why. I have been in love with Etsy ever since Sophie was born. This place is a mecca for all things handmade and vintage. Sophie's birthday party outfits and decor are usually purchased from a shop on Etsy and it is the first place I look for unique Disney items. Last year I came across Lover Dovers Clothing and fell in love with a dress. I knew it was perfect for Sophie, but for some reason I hmm-ed and hawed over it for months. When our Walt Disney World trip started to feel like a reality, I knew I had to order it for Sophie. I can picture her wearing this in both Epcot and Be Our Guest restaurant, and I know it will make her feel like a true princess. This picture was borrowed from the Lover Dovers' Etsy Shop. You guys... how perfect is this dress? Sophie looks like a mini Belle as it is, and this provincial dress is right up her alley. 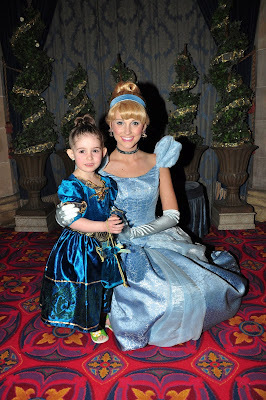 When Sophie was three, we paid a ridiculous amount on a package at Bibbidi Bobbidi Boutique for her. 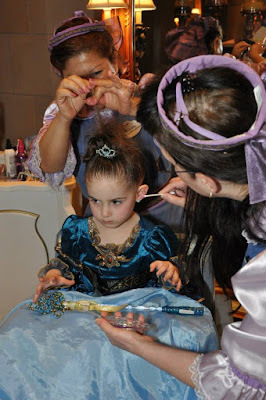 I thought she would love the experience of picking out a princess dress, having her hair and makeup done, and getting her pictures taken. Wrong. I was so wrong. As a joke, we use BBB to threaten her when she's misbehaving. I mean, look at this face... we paid a zillion dollars for 30 pictures with this expression. Bibbidi Bobbidi Boutique is AMAZING, and if I were 5 I would love it so much. It's just not for Sophie. What I'm getting at is, this day dress by Lover Dovers Clothing IS her. It's beautiful AND comfy. It doesn't have lace and frills and tulle. It's perfect for my girl. 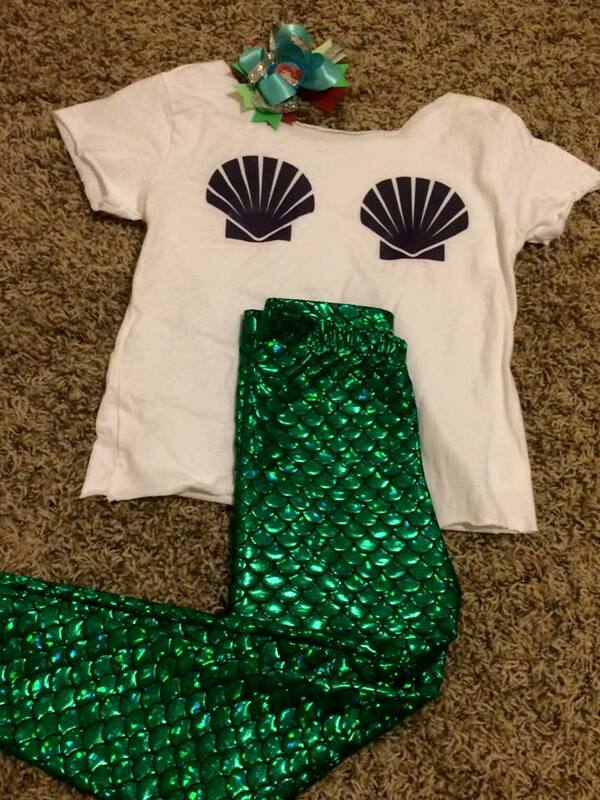 In fact, when it came and we realized it was a size too small, she cried real tears. Thankfully, Erin from Lover Dovers was so accommodating. I e-mailed asking if I could ship it back for a bigger size, and she replied almost immediately saying that it would be no problem at all. Customer service like that makes this shop even more magical! Sophie is in love with all things JoJo Siwa right now, she even said she wants to be JoJo when she grows up (or turns 14, I guess). If you want to be like JoJo, you have to have the bows. Good news -- I have a friend who makes bows that are beautiful and high quality -- much better than the ones you buy at a retail store! When I ordered Sophie the Provincial Belle dress, I wanted her to have the perfect bow to match. I messaged Kristen from Isabella's Hair Bowtique and explained what I was looking for. It took her less than 24 hours to come up with the perfect design! It is even better than what I had pictured in my mind. Kristen is so creative and talented, and her shop prices are extremely reasonable. She's an absolute sweetheart, so it feels good to support her business. If you've read any of my previous posts, you will know that Sophie absolutely adores Pluto. She and Pluto have had some pretty special times together at Disney. She has been named Pluto's Official Dog Walker, they've gone running from across the park into each others' arms (legit), and he has come out of the parade to see her on more than one occasion. Sophie faithfully carries her Pluto stuffie with her at all times on Disney vacations, and it might just help with some of the extra attention she has received. (She also sleeps with it every single night, so it's looking a little worn) Anyway, while many little girls admire Rapunzel or Cinderella, for Sophie it's always been Pluto. 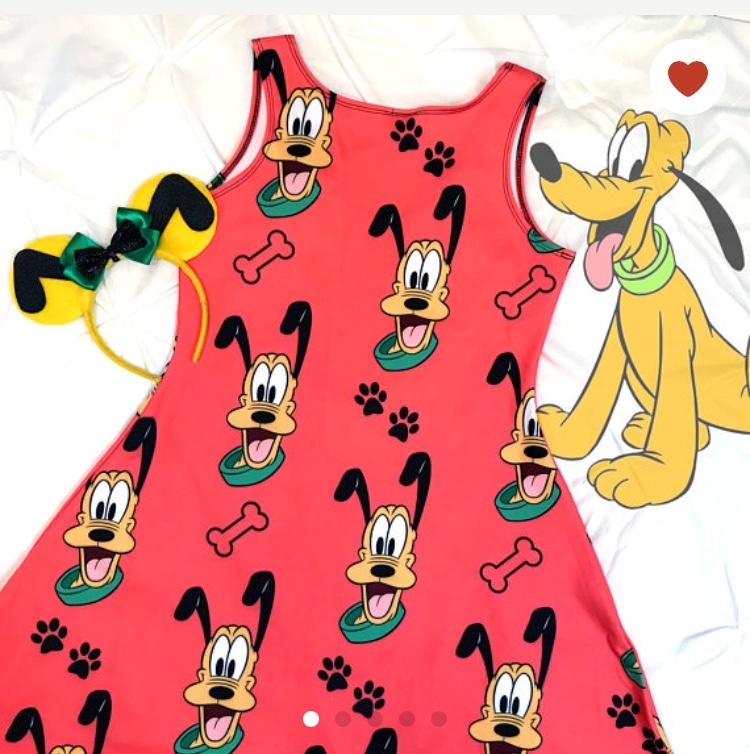 Do you know how hard it is to find apparel with Pluto on it for little girls? Pretty near to impossible. Even on my Etsy searches it's hard to come by. Imagine my excitement when I saw this dress while I was obsessively searching Disney related blogs last night. It's the most adorable, stretchy sleeveless dress I've ever seen and Sophie is going to FLIP when it arrives. I knew that she had to have it. This Etsy shop has the most amazing patterned dresses and skirts for girls and ladies. I wish I spent as much money on myself as I do on Sophie, because I had my eyes on a few for myself. Tiny Tim's is a local shop and I have to tell you... the Boss Babe behind the scenes, Tiarra, is amazing. I feel like she must have to work 27 hours a day to keep up with the demand for her products. (Yes... I said 27.) She is so incredibly talented at what she does, and she's just such a gem that people want to support her business. I found her on Facebook through an online fundraiser and have followed her shop ever since. I love knowing that when Sophie wears her pieces at the parks, she will be the only one with it on. On this Scuba Neck hoodie... because that's what's coming! So as you can see, I work so that I can support my online shopping addiction for my daughter. But every now and then I see something that speaks to me so loudly that I just have to have it... for myself. 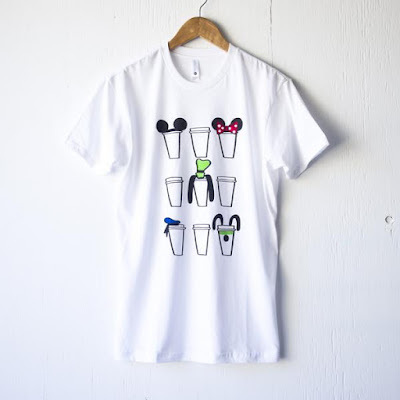 This tee was it. I follow Happily Ever Tees on Instagram, and when I saw that they were releasing this tee into their shop, I set alarms on my phone and subscribed to e-mail reminders to let me know when shopping opened. I was at Sophie's swimming lessons when I got the notification, and within minutes, I had my shopping cart ready to check out with this beauty in it. The fab five plus coffee? Yeah I think I'll have that. Me and white generally don't get along. I have ruined nearly every piece of white clothing I own. Ironically, the last victim was a pair of white denim that I spilled my Starbucks PSL on. I don't even care. This shirt may come home torn or stained or ruined, but I am still wearing it. 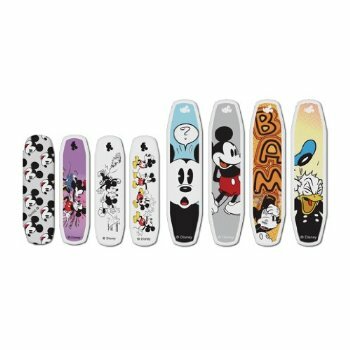 I'd love to know your favourite Disney shops (I mean, there's still 60 days for me to shop!) Let me know your faves in the comments! So we are 67 days out for our WDW vacation, and it's starting to get real! Just over a week until we book our FastPass+ reservations, and I am starting to feel like I need to get my summer clothes out and ready to pack! 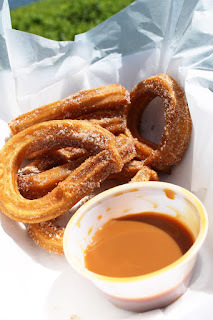 Rather than pack clothes and have them wrinkle, I compiled a list for our snack credit bucket list. I could have added WAY more, but in the interest of saving time and my waistline, I have narrowed it down to 5 per park. Did I mention that ALL of these items are considered a snack credit from the Disney Dining Plan? Amazing. 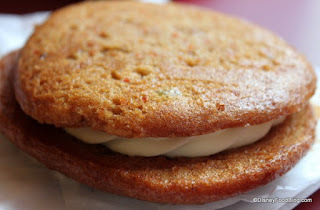 Writer's Stop Carrot Cake Cookie -- this is pretty much famous! 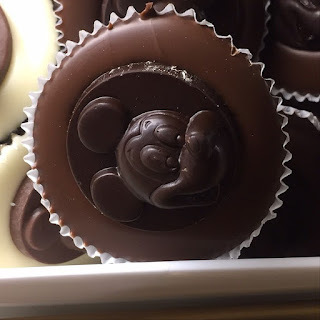 The Mickey PB Cup from Beverley Sunsets Sweet Spells. Decadence! Sometimes you just need popcorn. A Premium Mickey Bar, of course! How delicious does this Bugs Sundae from Discovery Island Ice Cream look? 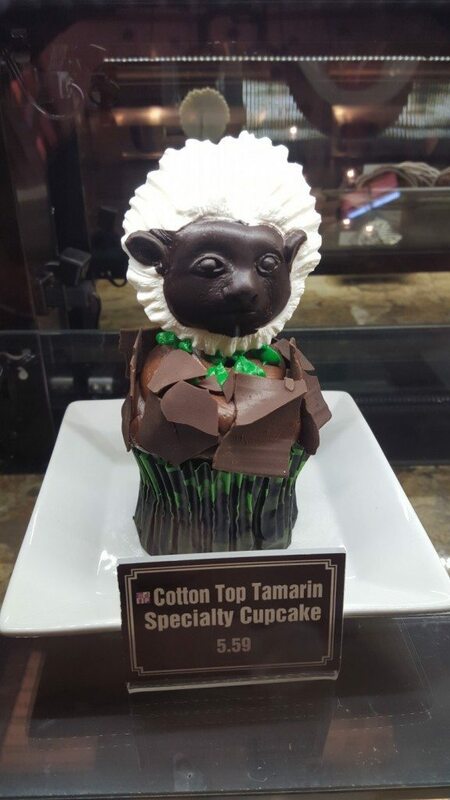 This Cotton Top Tamarin Cupcake from Kusafiri is a work of art! from La Cantina de San Angel had to make the list! When in Germany, you eat a hand-twisted pretzel! Hovels Stand has plenty! Sushi for a snack credit? Yes please! 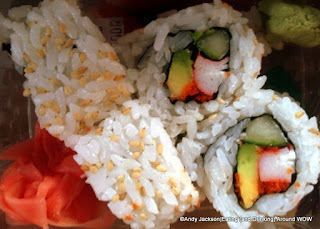 Kabuki Cafe has you covered. Yes, yes, yes. Give me all the lattes, please. Main Street Confectiorary while waiting for the parade! Ice cream and coffee? Yeah I like that. 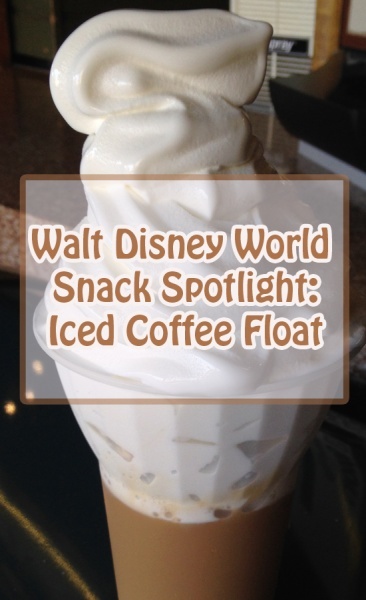 This Iced Coffee Float from the Sunshine Tree Terrace makes the cut. 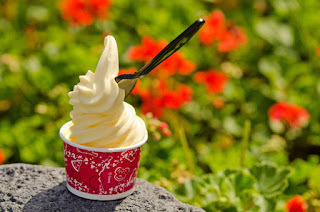 Finally... no trip to Disney is complete without a Pineapple Dole Whip from Aloha Isle. 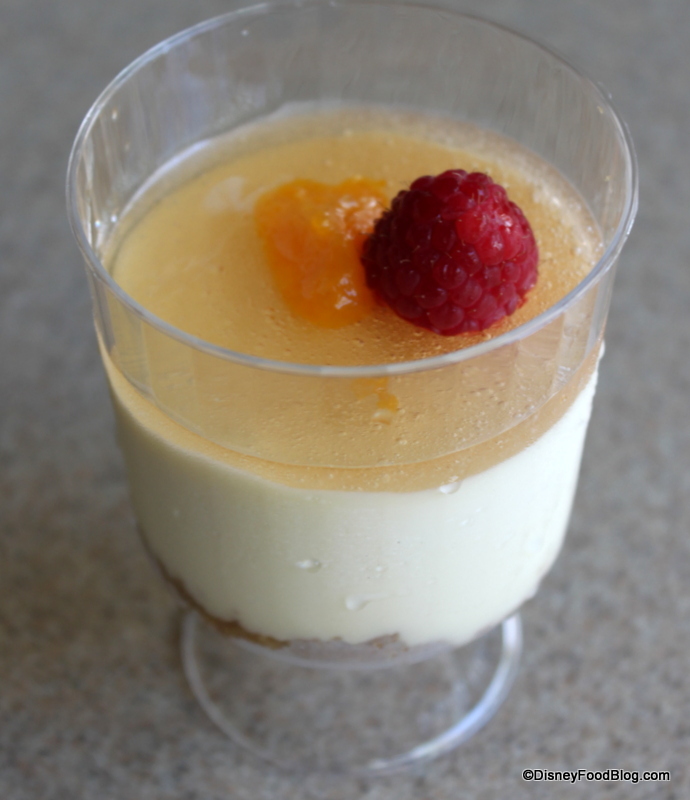 Copycat recipes are great, but nothing compares to the original! Did I miss any of your favourites? What should I add to my bucket list? Let me know in the comments! 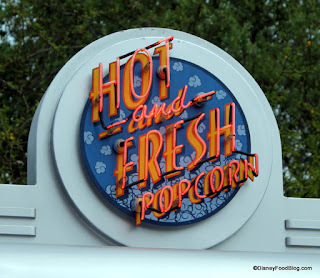 I borrowed a lot of these pictures from some of my favourite Disney sites and blogs. Be sure to check them out! So if you know Shane and I, it doesn't take long to figure out that we are total foodies. Our holidays and getaways kind of revolve around where we are going to eat. 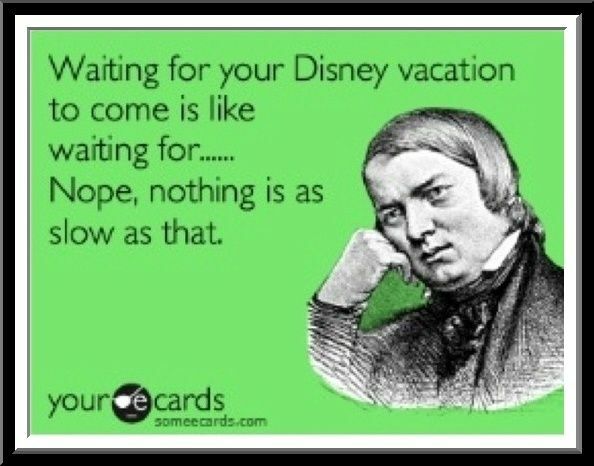 This is especially true when we go to Disney! You really can't top the food at Disney, and there is always something for everyone. Our daughter is typically a pretty adventurous eater, but she is completely content to live on Disney mac & cheese during our Disney vacations. To be honest, I can't blame her! 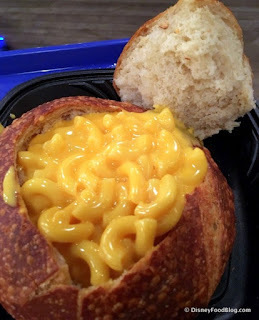 Mac & Cheese in a sourdough breadbowl? Carb heaven. Take me there. 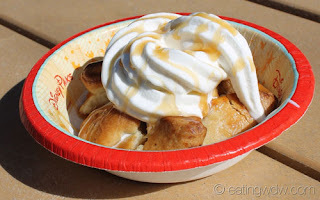 If you're planning a WDW vacation, I highly recommend adding on a dining plan. It is so convenient to have your meals pre-paid for and not worry about the additional cost on your credit card statement post-holiday. If you do your research on restaurants, you can plan your dining so that you actually save money using the plan. For our family, it is more about the convenience. There are several tiers of plans, but we opted for the middle-of-the-road classic Disney Dining Plan. This package credits each guest with 1 quick service meal, 1 table service meal, and 2 snacks per day. The Table Service meals typically include an entree and dessert... but wait for it.... starting in 2018, the dining plan now includes specialty alcoholic and non-alcoholic drinks! This means WINE people! This was probably the most important news to come out of 2017, just saying. Anyway, I digress...The first time we went to WDW, we came home with unused credits because I didn't familiarize myself with the plan as well as I should have. Not going to happen this time. 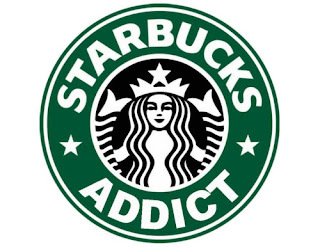 Now that I know the snack credits can be used for Starbucks, there will be no credit left untouched! This is the day we arrive in Orlando, so we booked a late dinner at our resort, Port Orleans. Our resort sounds like it has a lot of quick service food options, but a sit-down dinner will be what we need after a day of travelling. I am so excited to try the New Orleans inspired menu at Boatwright's Dining Hall! It is designed in the style of a rustic shipyard warehouse, and the comfort food on the menu has my tummy grumbling already. (I'm on a cleanse, so food in general is just really enticing. Probably why I chose now to update the blog.) Southern charm and hospitality -- can't be beat! The 3 restaurants to choose from are The Hollywood Brown Derby, Hollywood & Vine, and Mama Melrose's Ristorante Italiano. In 2014, we chose Mama Melrose's and loved it, but we thought we would try something different this time. Sophie's favourite part of Disney is interacting with the characters, so we settled on Minnie's Seasonal Dine at Hollywood & Vine. She will have the opportunity to meet and connect with the Mickey Mouse Clubhouse gang and nothing else will matter for the rest of the day! Hollywood & Vine is a buffet, not my first choice, but if I was planning a vacation for me, I would be sipping mojitos on a beach somewhere. We do Disney for our girl, and the joy we get from watching her makes it all worth it! 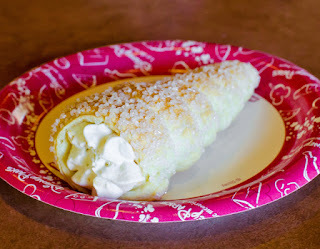 I should add, Disney buffets are not your typical buffet, and chances are, it will be amazing. Corndog nuggets from the kids' buffet. I'm the perfect blend of high maintenance and low-budge. Just sayin'. Day 2 will be spent at Epcot and will quite literally revolve around food. 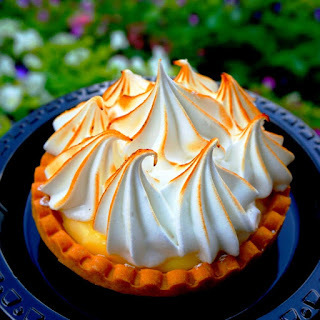 Epcot has the best food and drinks in all of Disney World. 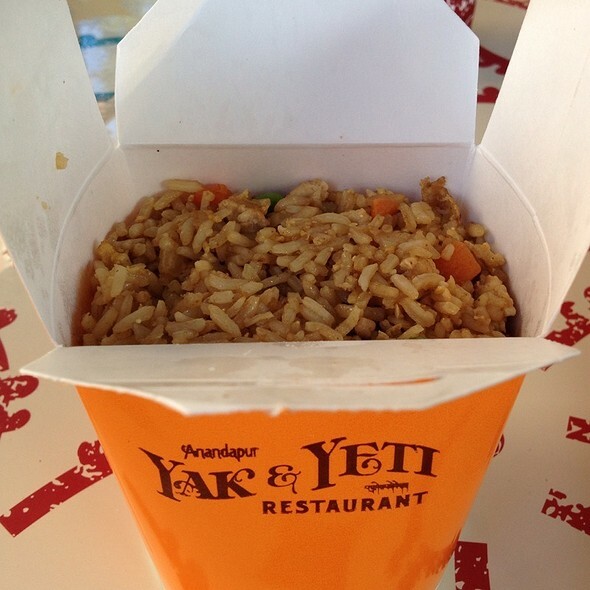 It features cuisines from all around the world, and that is totally my thing. Strangely enough, we booked our one sit-down meal at the same restaurant we visited in 2014, Teppan Edo. Teppan Edo is in "Japan" in the World Showcase, and of course features Teppanyaki style cooking. The experience is just as wonderful as the food, and these chefs are seriously top notch. They put on an entertaining show while cooking mouth-watering meals. Sophie loved the kid-friendly chopsticks last time (using a fork just wouldn't be the same). Being 4 years older and much more willing to experiment with new foods, I think she will get even more from the experience this time around! Finally! 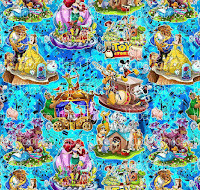 We will be visiting the most magical place on earth, and my very favourite of all the Disney Parks... Magic Kingdom! Entering these gates is like walking into a new world, and you better believe I will be standing in line for park opening! There is so much to see, taste, and do that it really never gets old. I don't feel like we've "overdone" the whole Disney vacation thing, because it is honestly different every time we go. I could go every year for the rest of my life, and I'm sure the magic wouldn't wear off! In my opinion, Magic Kingdom is all about the attractions, entertainment, and experiences. It doesn't compare to Epcot in terms of dining, but the experiences are top of the line. For our first day in MK, we will be having lunch with the princesses at Cinderella's Royal Table in her castle. Like I said, experiences. Sophie is more into the fluffy, cuddly characters like Pluto and Stitch than face characters like princesses, so I didn't originally book this dining reservation. After talking to her, she decided she wanted to go back and give it another try. We had dinner here in 2014, and the food was good (not exceptional, but good). The selling point of this establishment is really the location and the opportunity to meet several Disney princesses. It is 2 table-service credits, so this is a bit of a pricier character dining option. Ascending the spiral staircase in Cinderella's Castle to have lunch with princesses? Worth it. ** The Chef's Tasting Plate is also included as an appetizer for this meal. Today will be our re-charge day. We are taking a day off from the parks to explore our resort, check out the swimming pools, and take the boat to Disney Springs. We have two dining reservations for this day, but other than that we are keeping our day wide open for whatever we feel like doing! It's so important to recharge and refresh yourself on a Disney vacation. The heat, lines, and long days pounding the pavement can take a lot out of a person -- especially kiddos! Pool days are a must! For our chill day, we have a late breakfast booked at 'Ohana. We don't often get to check out the restaurants in the other resorts, so this is the perfect opportunity to explore! 'Ohana is in the Polynesian Resort and offers character dining for the Best Friends Breakfast featuring Lilo & Stitch. It is a family style breakfast (all-you-can-eat) and will be an additional opportunity for Sophie to interact with fur characters -- her favourite! Characters that are typically included are Lilo & Stitch (obviously), Mickey, & Pluto. Sophie absolutely adores Pluto, and she got a serious kick out of Stitch in Disneyland. I feel like this meal is going to be a highlight for her! The menu is set and served family style. It will include Hua Paka (scrambled eggs), Pua'a (pork -- ham & sausage), Uala Kahiki (fried potatoes), Mickey waffles, fresh fruit.... and my favourite... pineapple coconut welcome bread. YUM! 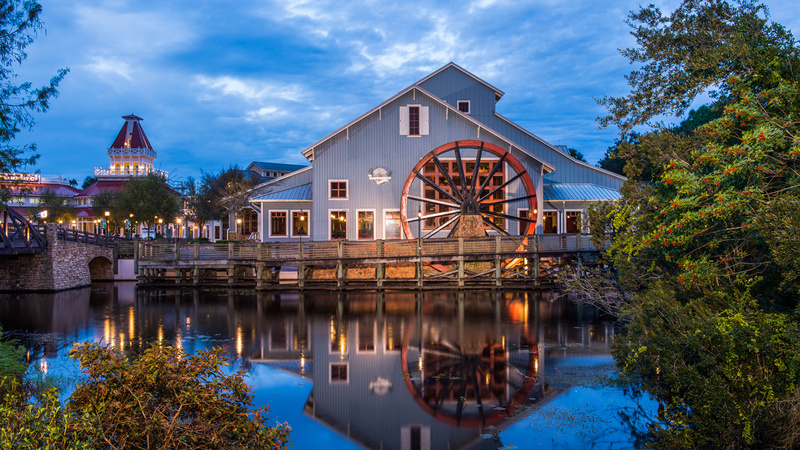 Our afternoon is wide open to explore, but we do have dinner reservations at Disney Springs. 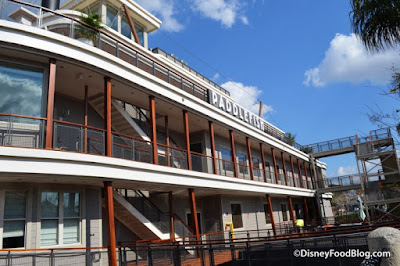 There were SO MANY incredible restaurants to choose from, but our seafood loving family settled on Paddlefish. This is a brand new restaurant that is on the Empress Lily, the former home of Fulton's Crab House. I know very little about this place other than it looks amazing. I mean, check this place out! 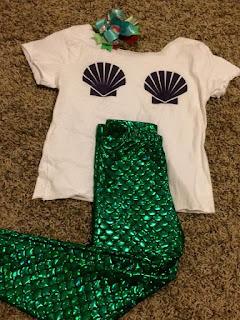 I have a thing for scallops -- have you noticed? I am so beyond excited for this day! 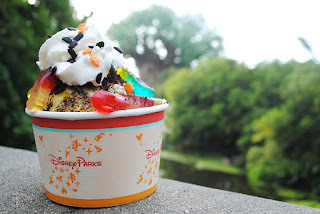 We will be checking out Animal Kingdom and all its amazing-ness! The last time we were at AK, Pandora wasn't open and all of the amazing Avatar rides and experiences weren't apart of it. We only spent a half day at the park, and didn't really feel like we missed out on too much. This time, I'm not sure one day will cover all of the rides and experiences we want to take in! Animal Kingdom's nighttime show, Rivers of Light, opened in February 2017 so we are so excited to be able to see it! This is a light and water show, and though it only lasts 15 minutes, the lines to get good seating are said to be pretty crazy.There are so many amazing FP+ options for AK, so we didn't want to use one up on a night show. We decided to go with the Rivers of Light dining package to guarantee good seating and free up our FastPass reservations. 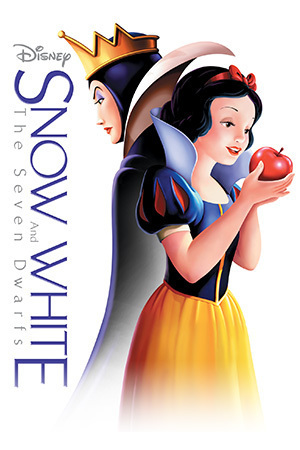 2) Beauty and The Beast is my favourite Disney princess movie. 3) We will have the rare opportunity to meet The Beast! I mean... how can you not try the grey stuff? It's delicious! I think that about sums it up for our table-service reservations! Stay tuned for a list of my snack credit bucket list items! 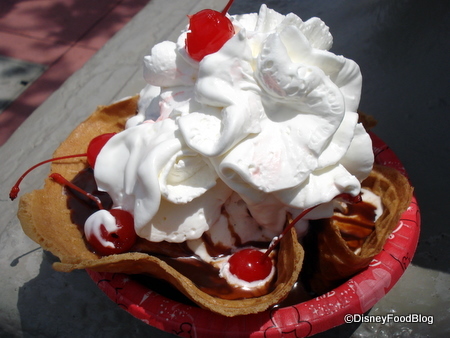 What are your favourite Disney table service restaurants? Let me know in the comments! It's been awhile since I updated the blog! I assure you, I have not lost my love for all things Disney, but sometimes life just gets busy and some of my side projects slip out of focus. Since our first trip to Walt Disney World in 2014, we have traveled to Disneyland 3 times. For our family, the smaller scale of Disneyland and the affordability and convenience of staying offsite just worked better. 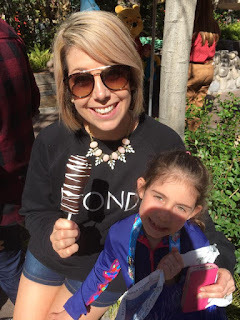 This February we spent a week in Palm Springs, California and made a day trip to Disneyland. It wasn't the full scale Disney vacation we were used to, but it gave us a Disney fix to hold us off until our next adventure. I am so excited to share that we will be heading back east to Walt Disney World in March 2018. The countdown is officially on, and it's only 171 days until we're back at the place Where Dreams Come True! We soon realized that even with a $4000 credit, we could never afford Au'lani. We left the final choice up to our six year old daughter, Sophie, and that's how we ended up booking Walt Disney World! What can I say, she's one lucky girl. From there, all we needed to do was pay a visit to our favourite travel agent, Donna, and decide on a resort. Ahh.... so begins the research. 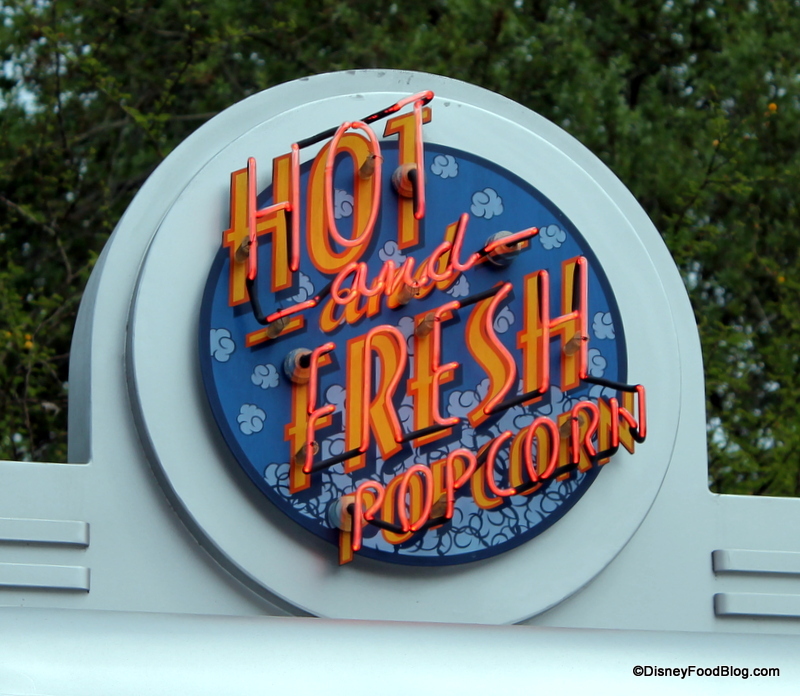 The last time we traveled to Disney World, we stayed at a value resort, The Art of Animation. The theming of this resort is incredible, inside and out. We stayed in a family suite and the dual bathrooms and separate sleeping areas fit our needs perfectly. We loved the main pool and were very impressed with the Landscape of Flavors Food Court. We LOVED it. This time, with the added bonus of our travel voucher, we wanted to step it up a notch and try a Moderate Resort. After a lot of research on quality, dining, theming, and refurbishment schedules, we settled on Port Orleans - Riverside. I have to tell you, the more I read about this place, the more excited I am. The resort is themed around the antebellum south of the Mississippi River and it is the perfect combination of elegance and rustic charm. 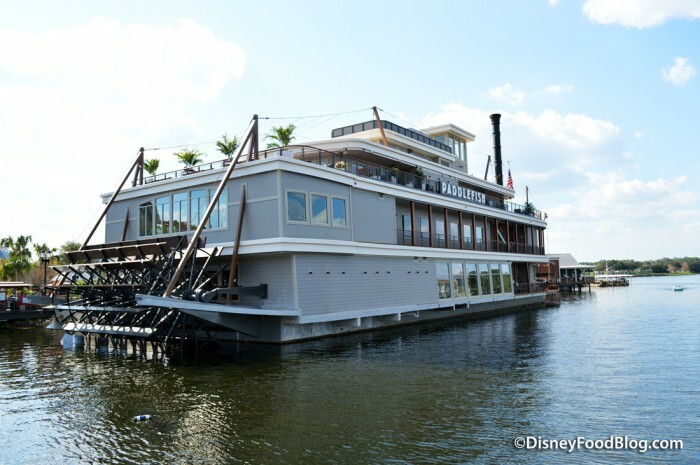 I can't wait to take the riverboat to Disney Springs and explore the gardens and grounds of this incredible property! I have a feeling we may become repeat visitors to this resort... I mean, c'mon! Check this place out! Seriously, this place is stunning. As I have mentioned time and time again, I am a planner. A researcher, a reviewer, an organizer, and then a planner. 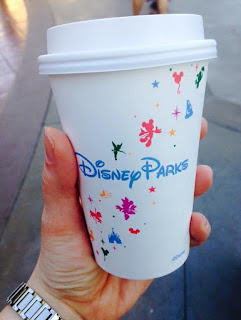 I pore over restaurant reviews, hotel ratings, blogs, and videos before each and every Disney trip. I have to admit, I love it. Plus, it gives me an excuse not to do laundry. Of all of the blogs, reviews, and tips that I have read, some of the most useful have been packing checklists. I hope that this can be similarly useful to you! I am sure I will forget something and have to amend it later, but here's a start. **** note - this is how I pack for my daughter. I'm 15 days out so packing for me will wait for another week or so. Here are a couple of her outfits that are ready to go. Firstly, I pack outfits, socks, underthings, and accessories in Ziplock bags. It keeps things together and saves time on busy morning. Check the forecast, pick a bag that suits the weather, and get going! I pack about twice as many bags as we have days in the park. I live by the philosophy that it's better to have too much than not enough! This gives me piece of mind. Even her Dad can get her ready with this system! Remember to throw an extra outfit in your backpack to have at the park. A spare change of clothes is always handy, and the ziplock bag can be used for any wet/soiled/messy belongings that you may acquire throughout the day. Pack layers. Mornings and evenings can be cool so it's nice to have leggings/pants, socks, and a light jacket or sweater. I also have plenty of shorts, dresses, and tank tops as 24 degrees Celsius feels pretty warm in February when you're coming from Saskatchewan. Pyjamas. 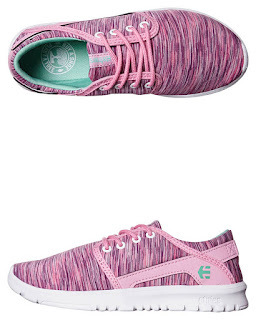 2-3 pairs is more than enough. Swim Gear. Sometimes your kids (or you) just need a break from the park. My daughter's favourite way to chill out is by the pool. I pack 2 swimsuits and a pair of flip flops for trips to the pool. Sun Protection. A hat and sunglasses are a must for little ones' sensitive skin and eyes. Comfy shoes are a must. We spend over 12 hours in the park each day, so it is definitely comfort first. We packed 2 pairs of runners and 2 pairs of sandals for her. 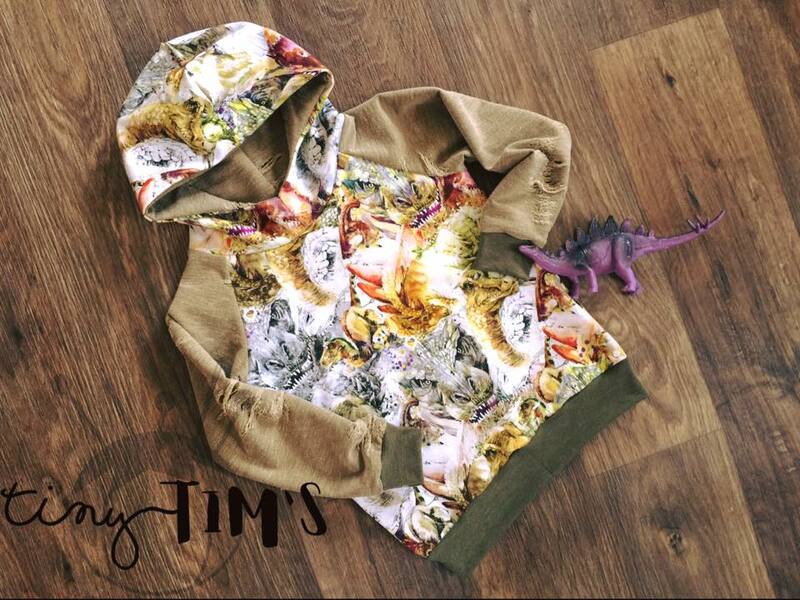 Buy Disney themed clothing ahead of time. It is way cheaper to buy at Target, Wal-Mart, Old Navy etc than it is to buy at the Disney Store. A rain poncho. It's much cheaper to get at Dollarama ahead of time than it is to buy one in the park. 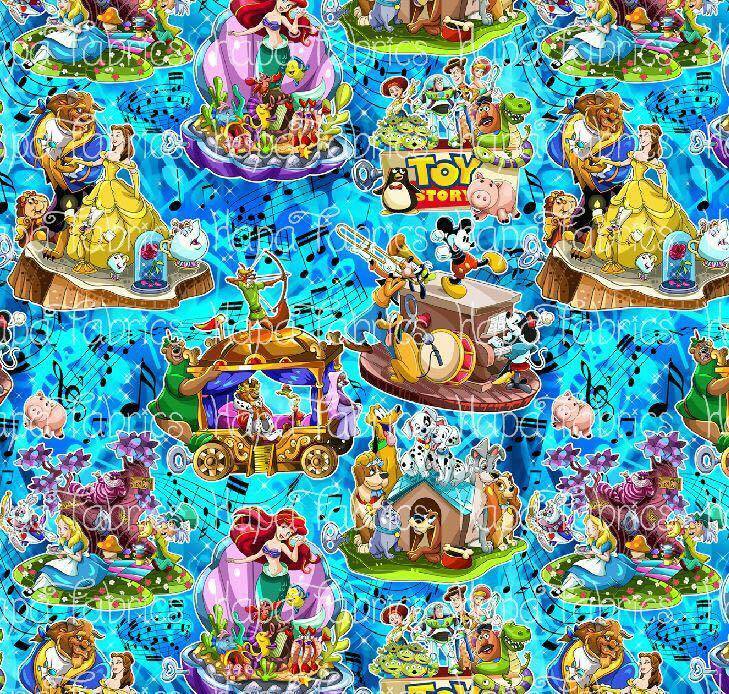 These might come in handy for Splash Mountain or Kali River Rapids! Etsy is a gold-mine for unique pieces. Sophie has 6 handmade Disney bows, 3 bubblegum necklaces, and that to-die-for mermaid outfit -- all purchased from Etsy shops. Okay, the fun stuff is over. Now it's time for the nitty-gritty. The first time we went to Disney World, I forgot to pack Sophie's puffers. We were already in Regina and were due to take off in hours. 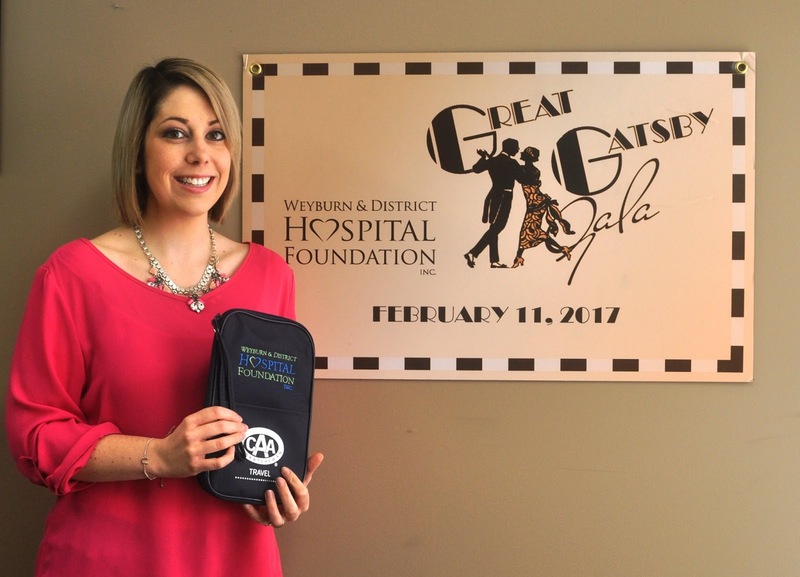 Her asthma was a lot worse then than it is now, and a flare-up could put her out for days. Luckily, a family friend of ours is a doctor and was able to call a pharmacy with her prescription for us to pick up before we headed to the airport. I also forgot to throw some band-aids in the backpack. They were in the hotel which did me very little good. Seriously, WTF? Sun-tan lotion - check your expiry dates! And, of course, a Medi Buddy kit to throw in your backpack or purse. Don't leave it in the hotel room. This is mostly for the travel portion of the trip, but there are definitely times in the room, and even in the park, when some of these come in handy. Portable DVD Player, plenty of Disney movies, and headphones. We throw this in the backpack that hubby uses for his carry-on. It has always made flying really easy with her. This is being released February 2nd, 2016 - perfect timing! A Leap-Pad or iPad. Maybe your kids aren't technology junkies, but mine sort of totally is. 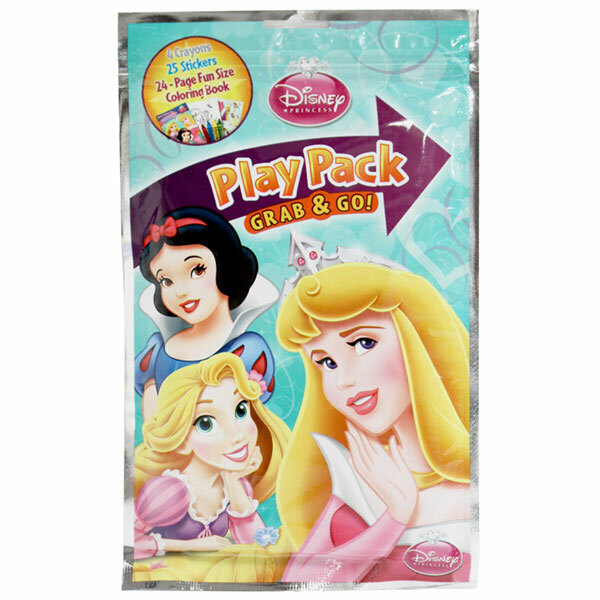 Disney themed coloring books, stickers, and activity booklets. We picked up a few of these from Dollarama ahead of time. A couple of stories to read at bedtime. We don't break from our bedtime routine ever. It's important to read together every day - even on holidays! A journal or notebook. Take 10 minutes to write about your day. 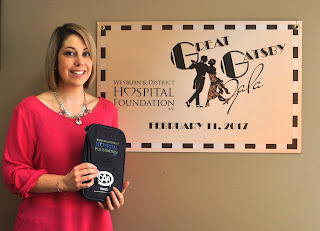 What a perfect keepsake! These are just a few extras to make your child's experience especially magical! Character stuffies. My daughter got so much extra attention from characters, cast members, and the performers at parades because of her stuffies. 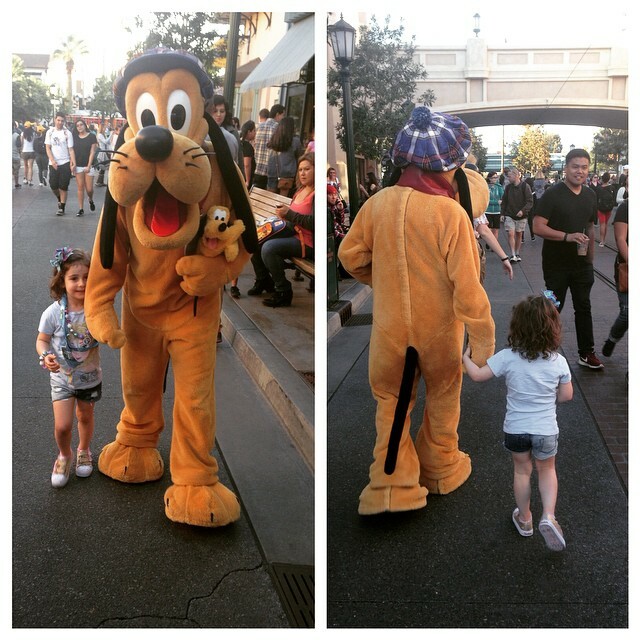 She was even named Pluto's Official Dog Walker thanks to a stuffy! Here Sophie is walking hand-in-hand with Pluto all the way down Buena Vista Street! Pins and Lanyards. If your child is collector, make sure to bring along your pins to trade with Cast Members! Sophie is really into collecting, but has yet to make a trade. Autograph Book and Sharpie. We like to have this ahead of time so we are ready for any impromptu meet and greets with characters. 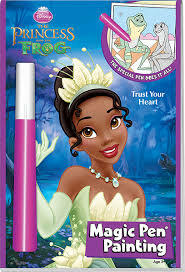 I've made mine in the past, but this year we ordered ahead of time from the Disney Store. Time is money! Of course I would forget to add this! They are obvious...and necessary! Well... I think that about wraps it up! Hope this helps! What are your packing list must-haves? Let me know in the comments! Above all else, I am a Mom. My greatest joy is seeing my daughter experience life and love and happiness. I am also a wife and a teacher, and a new Disney fanatic. 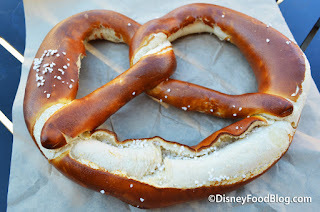 I feel connected to places I travel, and have fallen in love with Walt Disney World and Disneyland.